Fall is beginning in the northern hemisphere. It is easy to see that from up here – the many agricultural fields that were bright green two months ago are all starting to become brown. You can’t stop time. It’s funny, these things, the natural changes on Earth, the seasons, the real day night, the wind then calm – those are the things that make life on Earth special. We don’t have them up here, so when we hear about those natural occurring changes, I miss our planet! I’m not saying we don’t have changes up here too, because lately it really seems like we are having a lot! Last week, we had five external vehicles connected to us – two Soyuz spacecraft, one Progress, one ATV and one HTV-3. She hovered there for a little while, and then seemed to want to come back to us – moved ever so slightly toward the ISS instead of drifting away. We released her in a slightly lower orbit than we are – which means she should be going faster according to orbital mechanics – she should have been moving away, and forward of us. Instead she was drifting back toward us a little. The software in the system detected this as a “safety net/corridor violation” and sent an ABORT command. As a result, she sped away from us at warp speed! It was seriously like a Star Wars film. She flew away so fast that we had a hard time tracking her on the camera. Her name was Kounotori-3, meaning stork – so maybe she is like one of those heavy birds that take a while to get going, and then flies away at lightning speed. After some other issues with her GPS systems, she finally had a normal deorbit and entry into the atmosphere Thursday. Congratulations to our Japanese colleagues on a great mission for Kounotori-3. The second big change was the departure of the Soyuz 30S vehicle and her contents, Gennady, Sergei and Joe! We locked them in their Soyuz at 8:30pm GMT. We stay up until they land. We heard the undocking on the communications loop and finally saw the Soyuz a bit later as she was moving behind us. 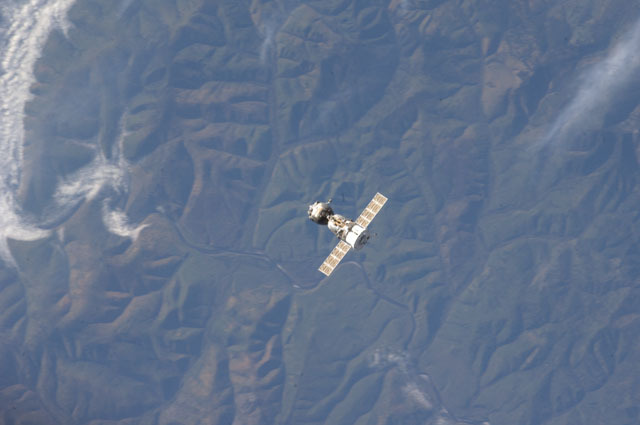 The ISS was actually flying belly first since this Soyuz was docked on the top of the Station. That way she could push off straight aft of the Station after the docking hooks were opened. So, it was difficult to find windows to watch her. Then a couple orbits and hours later she did her deorbit burn. We tried to watch but she was such a speck it was again difficult to see her. Our boys are finally back on Mother Earth. It was great to see their smiling faces on NASA TV up here, thanks to our control team who sent up streaming TV coverage.